I came with high expectations because 1) my coworker doesn’t stop raving about how it is his favorite truck and is always looking out for when it will be here, 2) all the great reviews, and 3) although this is my first time ordering, an old coworker gave me a philly cheesesteak sub from this truck a couple years ago when his order was messed up and was given an extra sub, and all I remembered was that I was super impressed. Even coming in with high expectations, the quality and taste of this sub far exceeded my expectations! I was a little worried that the chicken would be in big hunks, with chunks of fat hanging off of it, but I was more than pleasantly surprised to discover that the chicken was shaved and tender! I was also a little worried that the bun would be a hard, tough sub roll, but the bread was so soft, warm, and super delicious! Pros: the seasoning is PERFECT (not onion-y or garlic-y), the meat is shaved instead of in big hunks, the bread was soft but not soggy, and the foil wrap helped my sandwich stay warm all the way back to my desk. I also loved that the mushrooms, green peppers, and onions were all separate; I was able to have the mushrooms and peppers and omit the onions. (Some places have a pepper-onion-mushroom mix.) Cons: I only had one tomato slice, which was cut in half, so I had half a tomato slice on each half of the sandwich. I actually was almost through the entire first half before I even saw that there was a tomato slice. Plus it was a little pricey; I could have gotten an entire combo platter with 2 sides from another truck for less than the price of what I paid for just one sandwich from this truck. But that won’t stop me from coming back to Steak Bites, especially with the delicious quality of these sandwiches! Thank you for the fantastic lunch that didn’t leave me feeling guilty or heavy! I am from Philly and this is pretty close to a Jim's cheesesteak. If you like the traditional Philly cheesesteak, this is a good bet. Only criticism is that the steak and fries have too much salt. 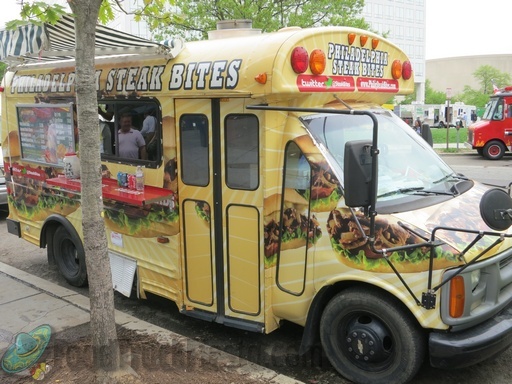 Of the cheesesteak trucks that are in the DC area, this is the best. The others just are not as good and sometimes give bad service! Steak Bites is not as good as some of the steaks in Philly, but still really good! I got the #1, the Philly Cheesesteak (w/ provolone). I appreciated the fact that it was still warm when I got back to my Dupont Circle office from L & 20th. The sub was very tasty and of a generous size. Great seasoning and the mix of toppings is just right. I'll definitely be back. My only tiny complaint is that the wait after ordering was about 10 minutes. But if the weather is nice I can tolerate that. OMG!!! Maybe it's just me but it was the BEST Cheesesteak EVER!! =) Not overly greasey like most places and it tasted sooooooooo GOOD!! FRESH AND HOT! This is the best steak and cheese in town there is not much I can say other than that the steak and cheese was perfectly cook, seasoned and hot. They give you are great portion it is a large sub and lots of fries if you get the combo. Even the soda was cold. I always look forward to getting a steak and cheese combo from them everytime they come. The guy that take you order is a pleasure to communicate with. 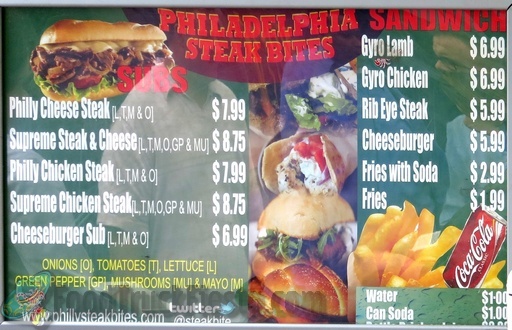 First of all, they claim that a soda "is included" if you order a Philly Cheese Steak and Fries. Totally false! You're actually paying the full meal price. My order was done quick (Points for that!) However, the bread gets soggy immediately and the fries could be fried a little more. Overall, it's a good sub and the fries are seasoned. The ordering staff was friendly as well. So, if they were the only Philly Cheese Steak truck on the block, I'd still go back and order from them. I was not satisfied. My sub and fries were lukewarm although my wait time was entirely too long. I'll just stick to going to Phillies Phamous Cheesesteaks! The first person taking my order was friendly. When I went to get my food, another worker-who was pretty rude -was at the window(i.e. customer service did not seem as important to him). He told me they didn't have a bag for my food until I told him the other guy told me they did....odd. People who ordered after me were getting their food before me which was puzzling being as though I had already been waiting for what seemed like 20 minutes. To sum it up, the french fries were tasty; the sub was mediocre. Just remember you can't treat people any kind of way after you get their money, say you don't give refunds, and then serve mediocre food. Steak Bites launched at Farragut Square on May 16, 2012. They serve Philly cheesesteaks as well as an assortment of subs.